The eff-you-mobile has a particular distaste for beating around the bush. Certainly not your workaday Corolla, isn't it? 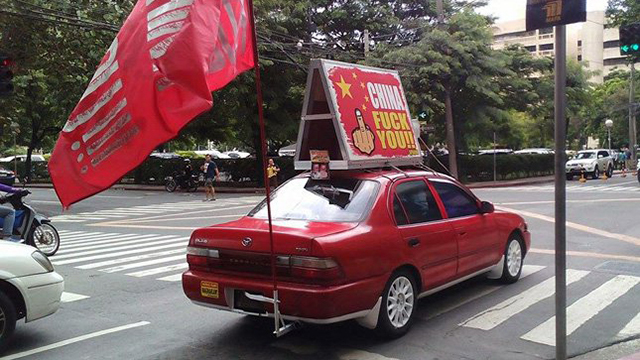 The Philippines is obviously not the biggest fan of China, nowadays—and the car is representative of this fact. "For weeks now, we have been receiving photos of this red, big-body Toyota Corolla roaming the streets of the metro. As you can see in these self-explanatory pictures, this car has been getting a lot of attention because it flaunts what seem like protest signs that scream: CHINA, F*** YOU! Obviously, the car owner is very livid at our fellow Asian country. Over what exactly, we don't really know. The photo senders did not offer any explanation; we bet they were also wondering. Although we can think of a few possible reasons: Perhaps it's to cry foul over China's perceived bullying when it comes to claiming territories, or maybe it's because some China-sourced products have been found to be dangerously substandard of late. We asked our legal columnist, Atty. Robby Consunji, about whether the Corolla owner isn't violating any law as he/she motors around while basically cursing another country to high heavens. His reply: "It seems okay to me! Freedom of expression is broad enough to allow the F word. Just expect the LTO to require the Top Load Permit. There's an annual fee for roof rack-equipped vehicles." Oh. We don't know which one is the worse adversary: China or LTO. What do you think? Photos from John Gabriel Baldon, Andreuw Lahamedjian, Arian Kazemi, Danica Angela, Gian Dimapilis and Chessica Mirasol"
Your take, road users? Is this too much or is this a valid way of expressing displeasure towards another country?